Perhaps more than any other city, Chicago&apos;s music promoters must distinguish themselves to find success in this sprawling nightlife scene. In a city as diverse and segregated as ours, bringing people together is forever a challenge. But great promoters can foster an experience that is unique and particular, every time. 1833 Presents is one such company well on its way to doing just that. 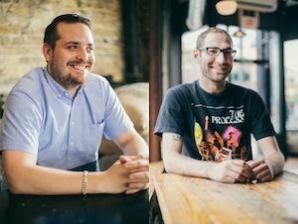 Founders Blake Witsman, 27, and Zack Eastman, 28, log long hours every day to organize events from start to finish. Whether it&apos;s for a musician they&apos;ve invited to perform locally, or the Chicago act for a national tour, 1833 manages booking, marketing, accounting, and everything in between for each show. “It’s all about the fan. It’s all about the artist," Eastman said. “Our goal is to become a brand in Chicago that you can trust." This means curating and organizing a series of nightlife events and concerts at venues across the city, spanning genres from rap to post-dubstep, and always pushing the envelope. Artists Eastman and Witsman have featured or booked recently include local hip-hop star Chance the Rapper, downtempo electronic duo Beacon, and rapper and Three 6 Mafia member Juicy J. The Logan Square-based company, founded in February, makes it a point to be distinctly Chicago: their name is a shoutout of the year the city was founded, as well as an ironic nod to their targeted demographic, the 18 to 33-year-old. And for every show 1833 works to book, it aims to create a one-of-a-kind experience true to the tastes, expectations, and excitements of its audience. “We look at each show uniquely and give it a certain TLC that doesn’t come with someone mass producing a show,” Eastman explained. Moreover, what the company is doing right, is tapping into the changing cultural landscape of the city. They recognize the shift and renaissance of local culture. Chicago is in a state of flux — one that can potentially radicalize the stature of the city as a place and incubator of culture — and suddenly, to foster nightlife in the city is both possible and a thriving business. Why? For one, artists of all fields are finally staying in the city. “In the past, I’ve seen people wanting to leave here, and now it’s not necessary,” Witsman said. In the past, community was in many ways the deciding factor in whether or not an artist or creator decided to stay within the city. Two or three artists might thrive nationally or internationally, but there was little room for more to succeed, creating an uncomfortable, even unwelcome environment for artists who aimed to call Chicago their home. But now, community thrives on a larger scale. A larger network means more professionals and more artists to showcase. When organizing shows with global acts, 1833 often brings in local performers to complement the act and surprise the audience. Simultaneously, the city itself is growing exponentially. Artists here are finding more outlets for their work, be it a new independent art gallery or a new theater company. In terms of music, the increase of venues (legal and not, traditional and nontraditional) allows musicians of all backgrounds to perform. This plays directly into 1833&apos;s Home Base — a series of parties and events featuring underground and experimental electronic music of the post-dubstep and future-bass variety. Past performers include Nguzunguzu, Groundislava and Teen Witch. For Home Base, that means booking acts that are growing locally, nationally, internationally, or online, but have yet to find large audiences. In many cases, the fans for the music are here, but they have yet to find outlets that cater to their tastes, and many musicians go unnoticed. In the end, that is what a party should be: a place for good expectations and even better surprises. Knowing friends who have left the city because it lacked the cultural drive they wanted, it is a heady experience to attend Home Base knowing that there are others out there who are excited by these new sounds&apos; bubbling weirdness and beauty. And because Chicago is of a size that means a hundred things could occur at one time, 1833 knows they have to foster experiences like these that are memorable long after they end. So far, they&apos;re well on their way to doing just that.